In a picture, random points are selected proportionally to the gray levels of the picture. 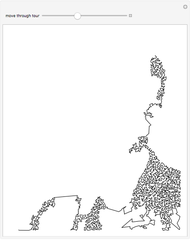 An algorithm for the "traveling salesman problem"—which asks for the shortest path through a set of cities without passing through any of them twice—is then used to draw a precomputed continuous line with no overlaps through the set of points. This Demonstration lets you see how the tour progresses. The built-in Mathematica command used to calculate the path is , with the Method option set to "RemoveCrossings". 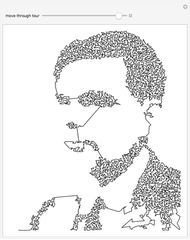 The man in the picture is Alan Turing, founder of computer science, born in 1912. C. S. Kaplan and R. Bosch. "TSP Art." (May 19, 2005) www.cgl.uwaterloo.ca/~csk/papers/kaplan_bridges2005b.pdf. 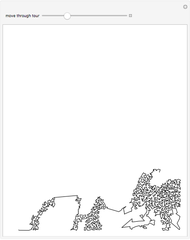 Enrique Zeleny "Traveling Salesman Art"